The Mast is a Brooklyn-based duo that combines lush electronic tapestries, velvet vocals, and infectious choruses into futuristic pop songs drawing on early IDM, post-dustep, and experimental music. In their live shows, percussionist and beat maker Matt Kilmer sometimes shifts from computer to drums, spurring vocalist Haale into syllabic vocalizations of a simultaneously primitive and cosmic order. 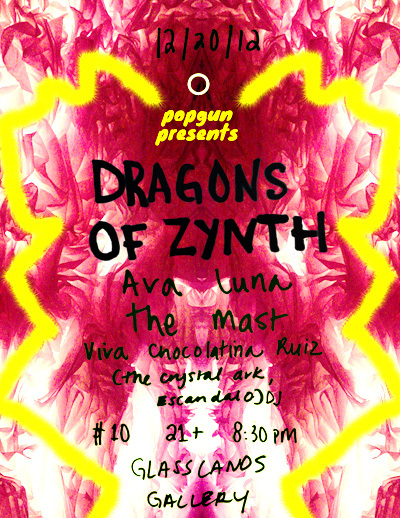 Dragons of Zynth calls their music ‘Afrotek’ and their live shows an ‘audio-physio-psychic’ experience. Members of TV on the Radio produced their last album and they toured all over the country, then disappeared for a while, this show will be their first appearance after a hiatus–will be exciting to see what they’ve been up to.